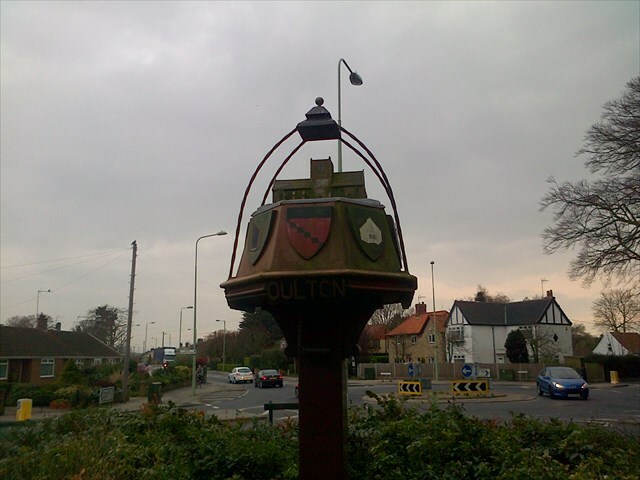 Oulton Village sign - an easy micro cache adjacent to this interesting village sign. Oulton is a village with the northern part of the conurbation of Lowestoft, Englands most easterly town. The centre of the modern village is the community centre with adjacent doctors surgery, dentist and pharmacy, with the public house opposite. The parish church of St Michaels is situated over a mile away overlooking the marshes. Stories explaining this distance vary, one mentions the black death of the middle ages leaving the old village in disuse but there are unfortunately no records to support this gruesome tale. The village sign was errected in 1990 and is topped by a model of the church surrounded by various shields, below these are some ornate carvings of sheaves of barley and the village name. There is a paved area upon which the sign stands but this area is rather smothered by a shrubbery which does provide a little cover for the visiting cacher from the traffic. Two of the shields depict Sir John Fastolfe (Lord of the Manor of Oulton (Houton) from 1419 until his death in 1445 and later imortalised by Shakespeare as Sir John Falstaff) and his wife Katharine who are buried in the church under reproduction brasses produced in the 1970's. The originals were stolen when the church was undergoing renovations in the 19th century. - the Arms of the Bacon family who were associated with the church in the early 14th century.